Wine on tap offers a convenient and environmentally friendly way to serve wine. The stainless steel kegs are 100% reusable. There is no bottle to throw away and no wine to waste! Wine on tap is one of the hottest new trends in the food and beverage industry. 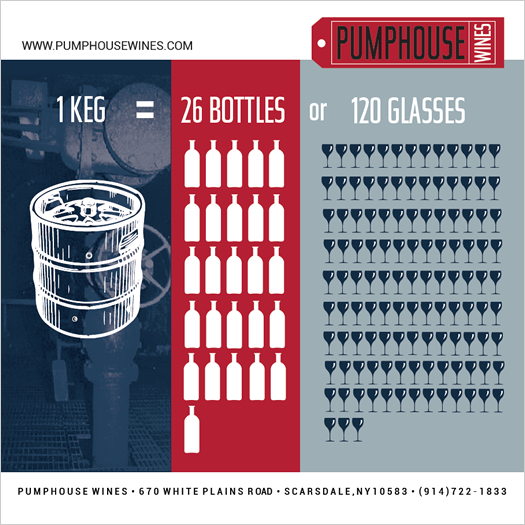 More volume, Less Waste - Wine is not exposed to oxygen so it stays fresh in the keg longer than in an open bottle. Environmentally Friendly - Stainless Steel kegs are 100% reusable. Speed - No need to pull a cork or restock a bottle. Wine Quality - Identical to wine from the bottle. It's HOT - Wine on tap is one of the leading trends in the food & beverage industry. Machined to perfection our tap handles embody the spirit of Pumphouse. They're sturdy, reliable, and convey the industrial vibe of our wine labels perfectly. We love them and your bar-keep will too!